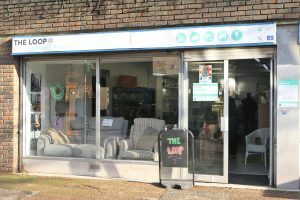 This is my post on community initiatives, as I recently visited Groundwork London’s The Loop at Grahame Park. If you can’t see the video please click here. I love a 2nd-hand furniture shop! This is something that must be in my blood. I remember as a tiny tot getting very excited about going into these stores. When it’s a charity shop all the better as you feel like you’re giving something back. The Loop took this all to another level though! Not only is it one of London’s fantastic community initiatives, providing affordable furniture to the residents of Grahame Park, it’s also encouraging recycling and providing DIY training on site. I have proudly taken on my role as ambassador to Groundwork recently. They have so many amazing projects on the go and this was first on my list to check out. It’s so exciting to discover that the hobby I have such a passion for is helping other people in this way. The shop is in the centre of the estate. Residents are able to drop off their unwanted furniture and it also provides a pick-up service. Apparently there used to be a fly-tipping issue in the area so The Loop has provided a solution. The great news is that a good deal of bulky items that would have just ended up contributing to landfill are now being upcycled. Obviously not everything that is donated is in tip-top condition. As you may have seen before with some of my posts, someone else’s trash can become treasure with a little bit of work. I spoke to Doug Coull who is a furniture restoring expert in the workshop. If an item needs attention he’s your man. When I spoke to him he was actually resizing someone’s table which was too big for their home, which is another service they provide. What I love about this most simple of community initiatives though is that they are also passing on skills. Residents can come in for DIY courses and learn the necessary techniques to ‘make do and mend’ items themselves. Daniel Khalid has worked in the shop since it opened, and comes from the estate. He remembers when the site used to be a betting shop. Daniel explained that if he didn’t have the opportunity to work there he would probably be at home playing video games. 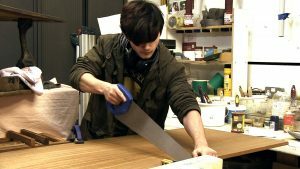 Instead he has learned many new skills and says he now understands so much more about the benefits of recycling and upcycling. It was so heart-warming to see first-hand the many positive benefits radiating from this place. I could also tell it was a real hub of the community. The staff and volunteers clearly loved working there, but there was a positive vibe coming from the customers as well. What a fantastic enterprise launched by Groundwork London. 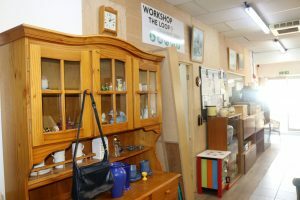 The building used to house a betting shop, now it prevents items being fly-tipped or going to landfill, teaches residents skills and provides affordable furniture to the locals. If you feel inspired to upcycle something you might have thrown away you can check out my guides for the following; painting a fabric armchair, pine table and chairs, a chaise longue, dining room table and chairs, vases, mirrors. I can even show you how to make a cushion out of a shirt! Thats a brilliant project for the community and I hope some reporting from you will promote them. 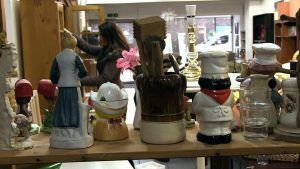 We have something similar in Shetland where furniture is upcycled and other items resold for Cope charity. They also employ disabled people which is great. Nice to see items like this getting coverage. Thanks Stuart, I just love to know that projects like this are happening in the world – when you watch the news it’s easy to think there is only misery! Hi Georgina , hope your well , thanks for your support , Doug. Thank you for your starring role Doug! Fabulous video, great to see Doug Coull being witty as ever! Seriously though, the loop is a great place. Great video. The Loop is a really amazing place -so glad you have showcased this great project doing so much for our local community in Grahame Park! Doug & Daniel when are you getting your own show?